This mountain road marks the way to Mt. Asama, which straddles the border between Nagano and Gunma prefectures. A building stands in a meadow. Mountains and clouds are in the background. Looking down toward the Akechidaira Ropeway in Nikko National Park. 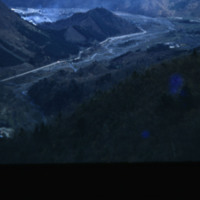 A river valley is in the background. 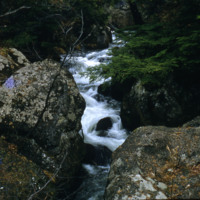 Rapids flowing in a small river. 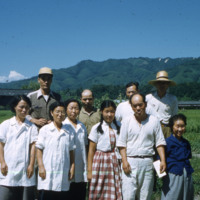 A mixed group of people stands near a field. In the background are buildings and low mountains. Akechidaira Ropeway - The Akechidaira Ropeway is a Japanese aerial lift line in Nikkō, Tochigi, operated by Nikkō-Kōtsū. The observatory has views of Kegon Falls, Lake Chūzenji, and Mount Nantai. The line opened in 1933, and reopened in 1950. In autumn, traffic can sometimes come to a crawl, or even a complete stop, as sightseers take in the breathtaking scenery of the fall colors. 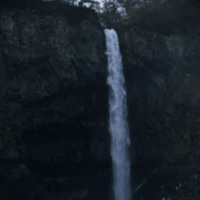 Kegon Falls - In 1927, the Kegon Falls were recognized as one of the "Eight Views" which best showed Japan and its culture in the Shōwa period. The name is derived from the Buddhist sutra Kegon-kyo (Flower Garden Sutra). The creation of the falls occurred when the Daiya River was rerouted due to lava flow which created twelve (or so) smaller falls in addition the main Kegon Falls that reach a height of 318 feet (which are pictured here). Kegon Falls became infamous for suicides after Misao Fujimura, a philosophy student and poet, wrote his farewell poem on the trunk of a tree before he jumped from the falls on May 22, 1903. 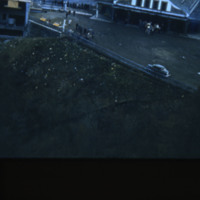 Due to the publicized story, the falls became an ideal place for others to follow suit. Mt. 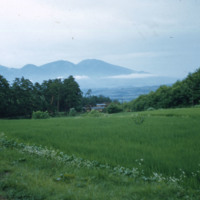 Asama – Mt. 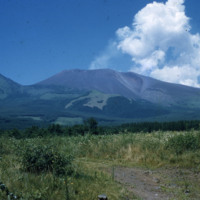 Asama is the most active volcano of Honshu and has had a long recorded history of eruptions. The volcano erupted nearly 400 times in 1941 alone. Even today the volcano is still active (in June of 2015 was the latest recorded eruption as of this time). In 1783, Mt. 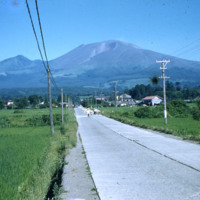 Asama had one of its largest recorded eruptions. It resulted in more than 1,000 (some estimates say 1,400) deaths and the destruction of 4 villages and many homes. The ash clouds hung over the island and caused heavy thunder and lightning storms for at least two months. We have record of eruptions in over 140 different years (not counting individual eruptions within those years) from 685 AD. "Suicide in Japan" by Jushiro Koshinaga, Mamoru Iga, Thomas Noguchi, and Joe Yamamoto in Social Science & Medicine Part A: Medical Psychology & Medical Sociology; Vol. 12, California State University, 1978, pgs 507-516.